A Federal Aviation Administration (FAA) “conservative” assessment of changes in civil aviation that would result from the effect of LightSquared’s wireless broadband transmissions on GPS would exceed $70 billion dollars, largely because of delays and changes in the planned rollout of the Next Generation (NextGen) air traffic control (ATC) system. The report completed on July 12 is just the first of many such assessments expected from federal agencies over the next few weeks in response to a request from the National Space-Based Positioning, Navigation, and Timing (PNT) Executive Committee through its National Coordination Office (NCO). The NCO seeks the assessments as part of its effort to provide information and comment on the Federal Communication Commission (FCC) proposal to allow LightSquared to build a national network of up to 40,000 high-power terrestrial base stations that would transmit in the 1525-1559 MHz band adjacent to the GPS (and other GNSS) L1 frequencies. LightSquared’s revised proposal submitted to the FCC on June 30, following extensive tests that showed widespread disruption to GPS receivers under its original plan, calls for initial use of a lower 10-megahertz channel (10MHz-low) starting in 2012, operation at “reduced” power, and an agreement to a “standstill” in terrestrial use of the upper 10-megahertz channel (10MHz-high). LightSquared would still begin full use of both bands in 2014. On Saturday (July 30, 2011) the FCC winds up a 30-day comment period for the latest LightSquared proposal and the results of tests conducted by a Technical Working Group (TWG) over the past few months. Copies of the FAA report were obtained by the Coalition to Save Our GPS and made available yesterday (July 27, 2011). · LightSquared’s initial operations at the lower 10 MHz channel even at “reduced” power levels would impact the aviation use of high-precision GPS receivers. · We estimate it would take 10 years to design, develop, certify and install modified equipment in the civil aviation fleet. · LightSquared’s planned operations would result in the loss of GPS-enabled operational, economic, and public safety benefits across the National Airspace System. · The FAA would be compelled to return to dependency on ground-based navigation aids. · Billions of dollars in existing FAA and GPS user investments would be lost. · The FAA would also need to replan Next Generation Air Transportation System (NextGen) investments, which would result in additional development costs and delays. Although LightSquared interference would pose an investment loss of $6 to $7 billion through Fiscal Year 2011 (FY11), the largest portion of the adverse effects projected during a 10-year period (2014–2023) would stem from delays in the NextGen project designed to transform today’s radar-based ATC into a satellite-based system. 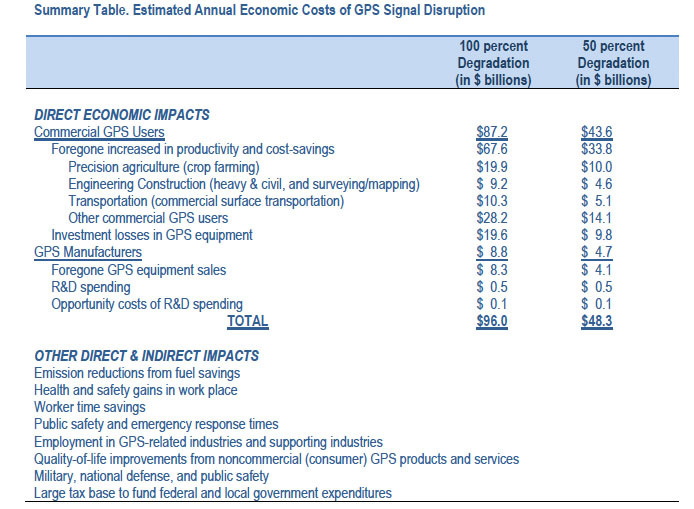 The FAA estimated that the aviation industry has invested another $3 to $4 billion in GPS equipment through FY11. · 794 lives lost with a public safety impact of $5 billion — all but 64 of them involving general aviation (GA) and the remainder commercial air carriers. The estimated loss of life would stem from accidents arising primarily from degradation or delays in three areas of aviation operations heavily dependent on GPS: approach and landing, prevention of “controlled flight into terrain,” and runway incursions. The FAA assessed LightSquared’s proposed “solutions” to its interference to GPS aviation equipment — in-line filtering or replacement with all-new receivers and antennas — as, respectively, “high-risk and not feasible” or medium risk and requiring six to 10 years to deploy. “The FAA report is an extraordinary indictment of LightSquared’s plans," said Jim Kirkland, vice president and general counsel of Trimble, a founding member of the Coalition to Save Our GPS. "The list of harms LightSquared’s plans would cause just goes on and on. 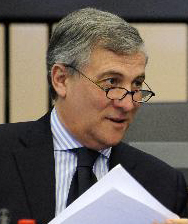 How much more evidence is needed to stop wasting time on this irresponsible plan?" Similarly dire evaluations are expected from other federal agencies with investments in and responsibilities for overseeing such high-precision, GPS-dependent activities as large-scale farming, construction, surveying, time synchronization, crustal monitoring, and military operations. 1) Summarize and quantify current and future benefits provided by use of GPS-based applications and any cost-benefit analyses. 2) Summarize and quantify total sunk costs in GPS-based infrastructure (prior years to date) and planned investments going forward. 3) To the extent possible, qualify, quantify, and describe risks to your agency’s GPS-based mission capability, including “lost benefits” if GPS performance were degraded (or lost) due to LightSquared’s signals including the costs to modify (or replace) GPS receiver infrastructure and the time frame required to replace that infrastructure.